Culture: The Uchiha clan are known for their amazing abilities and quests for power. The culture is very strict with a strong sense of duty, leaving its members well-focused, committed to training, and very respectable. Due to their violent history and heavily sought-after Sharingan, however, many members tend to seclude themselves from regular society for their own safety. Despite this, the Uchiha have a strong desire to connect with others on a meaningful level. This often leaves them conflicted, ultimately leading them down either a path of hatred or a path of love. 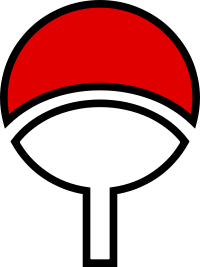 History: The Uchiha clan descended from Indra, the elder of the two sons of the Sage of the Six Paths. Indra inherited the Sage's "eyes", powerful chakra and spiritual energies. When it came time for the Sage to choose a successor, he questioned the two on what course of action they would follow to bring order to the world. Indra believed that power was the way to bring peace, while Asura, the younger son, believed love was the way. The Sage favoured Asura's ideal, and therefore designated him as his successor, causing Indra to be filled with jealousy and hatred. From this hate came what Tobi calls the Curse of Hatred (憎しみの呪い, Nikushimi no Noroi). From Asura descended the Senju clan who would be the eternal rivals of the Uchiha. However, the Uchiha suffered another more dangerous curse: a passionate love that can become a bottomless well of despair the moment the one they care for most is dead. Before the founding of the ninja villages, the Uchiha were one of the many mercenary clans for hire. Because of their Sharingan as well as battle prowess, the Uchiha clan came to be known as one of the two strongest clans, the other being the Senju clan. Madara Uchiha was particularly powerful, and, upon attaining the Mangekyō Sharingan, took control of the clan. Under his leadership the Uchiha grew stronger, conquering whatever clans they came upon, such that, whenever the Uchiha clan was hired for a job, the opposing side would hire the Senju, and vice versa. Years later, after the Nine-Tails' Attack on Konoha, Konoha's elders began to suspect that an Uchiha was behind the attack because of their ability to control the Nine-Tails with their Sharingan. Tobi stated that the clan was forced to live in a corner of the village, ostracised from the rest of the community, and placed under heavy surveillance. This gave birth to ill-will amongst the clan and the Uchiha interpreted this as confirmation of what Madara had warned them of years earlier, and began to plan overthrowing the village. Itachi disagreed with his father's coup d'état plan, and informed Konoha's leadership of what the Uchiha were up to. Shisui Uchiha, who had been told to keep an eye on his best friend Itachi also disagreed with the clan's plan and joined Itachi in his mission to put a stop to it. He attempted to use the ability of his Mangekyō Sharingan: Kotoamatsukami to Danzō from committing the genocide, but once again, Danzō — determined to protect the village the only way he saw possible — stole Shisui's right eye from him. Saddened that he had failed to stop Danzō, Shisui met with Itachi and gave him his left eye before the elder came after it as well, telling him to protect the village and the name of the Uchiha. The Third Hokage, Hiruzen Sarutobi who had disagreed with the treatment the Uchiha were receiving, tried to negotiate for a more peaceful solution, but as time passed and that strategy seemed to be getting them nowhere, Danzō took matters into his own hands and inveigled Itachi to commit the genocide with threat of his clan's actions creating another war and innocent children, such as his little brother, becoming a casualty. Within one night, the entire clan was slaughtered with only one known Uchiha left alive: Itachi's younger brother, Sasuke. Sasuke would spend the next few years trying to avenge their family by killing Itachi, something Itachi had planned from the very beginning. After accomplishing this goal, Sasuke learned of Tobi's existence. Tobi, who is in fact Obito Uchiha, another survivor of the clan who was also the one behind the Nine-Tails' attack, told Sasuke about the Uchiha's history and why Itachi had wiped out the Uchiha, prompting Sasuke, with Obito's help, to resolve to destroy Konoha. Sasuke would later be shown the truth by Itachi himself after he was reincarnated. (Excerpt from naruto.wikia.com). Description: The Uchiha possess the unique Doujutsu of the Sharingan. The Sharingan is a type of eye that an Uchiha member can activate at any time to give them incredible optical abilities. It appears primarily red with 1-3 "tomoes" around the user's pupil. The Sharingan gives its user increased Perception, the sensory ability of being able to "see" chakra, and a slight increase to Speed due to their ability to track/predict movement. Additionally, if a Sharingan user sees a jutsu be performed while they have their Sharingan active, they receive -30% to the cost of training that same jutsu if they choose to learn it. Finally, an Uchiha with the Sharingan active can detect Genjutsu of up to twice the level of their Perception. The Sharingan costs chakra equal to its level divided by 4 to use (each post), and may be activated/deactivated as often as the user wishes. Base Value: Perception increased by +0, Speed increased by +0, no chakra-sensing ability. Incremental Value: Perception increases by 0.1 levels and Speed increases by 0.25. At level 250, an Uchiha can use the One-tomoe Sharingan to see and identify chakra in their Close Perception range. The level of detail is enough that they can even detect chakra-natures as they are being molded. At level 500, they can use the Two-tomoe Sharingan to see chakra within their Medium Perception range. The level of detail is less than Close range, only allowing them to see chakra signatures. At level 750, they can use the Three-tomoe Sharingan to detect chakra within their Long Perception range. This has even less detail, only allowing them to see a field of chakra and not being able to pinpoint a location (or direction). This effect of the Sharingan is considered to be a sensory jutsu. Mastery: Mangekyō Sharingan- Users who have unlocked the Mangekyō Sharingan can perform a variety of forbidden techniques involving their Doujutsu (these jutsu can even be cast directly from the user's eye). This includes anything from advanced Genjutsu such as Tsukuyomi to unrivaled Ninjutsu such as Amaterasu. Shinobi can train these jutsu if they wish (see spoiler below) as well as apply for their own custom jutsu using the Mangekyō Sharingan. When using a jutsu with Mangekyō Sharingan, the user's eye will bleed just before casting. Note that using any jutsu that requires the Mangekyō Sharingan will harm the user's eyesight-based Perception permanently. The extent of this varies based on the jutsu and is listed for each individual jutsu that uses it. An Uchiha can unlock the Eternal Mangekyō Sharingan by transplanting another Uchiha's Mangekyō Sharingan in place of both of their own. Shinobi with Eternal Mangekyō Sharingan will not damage their eyesight when using jutsu that require Mangekyō Sharingan and will no longer suffer any eyesight-loss they once had. Drawback: Many Uchiha tend to be very proud and sometimes overconfident of their abilities. Because of this, they usually focus on the abilities they have rather than learning new ones. Uchiha are only capable of learning a maximum of 3 Specialties and 3 Elements (as opposed to the default of 4), and they only start with 3 Focuses rather than 4. Due to the incredible strain the Sharingan causes on the user's body, Uchiha will not regenerate chakra while it's active. Finally, all techniques that use the Mangekyō Sharingan cost an additional +40% chakra to activate and an additional +40% Skill Points to train. Description: In order to initiate this jutsu, the user must make eye-contact with their target. Additionally they must have had Mangekyō Sharingan active for at least 3 posts. Once triggered, the target is put into an illusion that the user controls entirely. This jutsu is legendary for its ability to manipulate the victim's mind to the fullest extent. This can make the victim perceive literally anything, though if it is used to torture the victim, they will immediately pass out after the 3 posts are up. If they release it any sooner, the victim will receive -100 to all stats for 3 posts. Ninja cannot auto-detect this Genjutsu with high enough perception, unless they have the Mangekyo Sharingan. Every time this jutsu is used, the user's Perception will be permanently reduced by 25 when detecting with natural sight. Description: In order to activate this jutsu, the user must have had Mangekyō Sharingan active for at least 3 posts. Once activated, the user's eye will bleed and, after 3 seconds, they can ignite anything in their line of sight with a 5-cubic meter burst of flames. The Amaterasu is infamous for its un-extinguishable black fire, receiving its name from the ancient Japanese Sun goddess. Once activated, these flames will burn for the remainder of the thread. For prolonged exposure, the burns worsen. These deal 2nd degree burns on initial contact, 3rd degree burns after 1 full post of contact, 4th degree burns after 2 posts, 5th degree burns after 3, and incineration after 4. Because these flames cannot be put out through normal means, the only way to get rid of them is with a supernatural method (sealing them away, extracting the chakra from them, etc) or remove whatever they are burning. These flames will not be hindered when interacting with other jutsu, and are capable of burning jutsu up to a cumulative level 1000. Every time this jutsu is used, the user's Perception will be permanently reduced by 25 when detecting with natural sight. Description: The user decrypts a genjutsu that has been applied onto them and casts back a technique with identical effects onto the opponent. In order to use this technique, the user must be able to see the genjutsu caster and must have had their Mangekyō Sharingan active at the time of being put under genjutsu. Every time this jutsu is used, the user's Perception will be permanently reduced by 25 when detecting with natural sight.